AEMET, Spain’s national weather agency has upgraded its weather warnings for Friday with much of the east of the country on alert for heavy rain and thunderstorms. Tomorrow there are orange alerts for heavy rain in the provinces of Alicante and Valencia that span the Costa Blanca. There are also yellow alerts for heavy rain and thunderstorms in Cataluña (Barcelona and Girona), the Comunitat Valenciana (Alicante, Castellón and Valencia) and the Balearic Islands (Ibiza, Formentera and Mallorca). 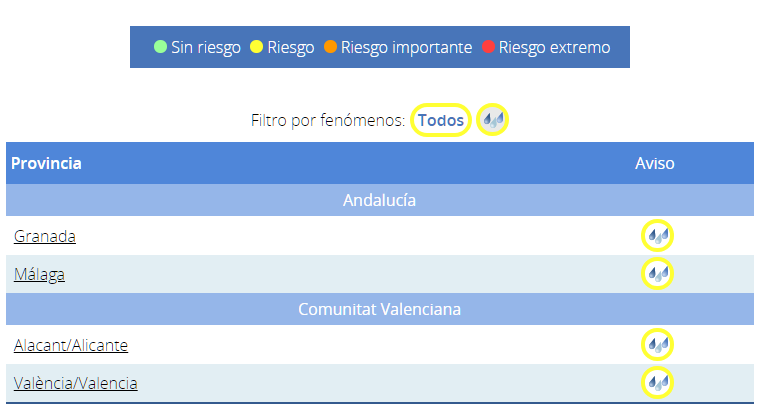 On Saturday yellow alerts will remain in place in Alicante and Valencia and be joined by the Andalucian provinces of Malaga and Granada. A DANA, an isolated high altitude depression, is expected which, together with the presence of a warm and humid flow from the Mediterranean, will cause a marked instability of the atmosphere across much of the country with showers and storms – mainly in the east and southeast. Between Saturday (September 8) and Monday (September 10) with the DANA most likely centered on the southwest and the east the most affected areas will be eastern Andalucia, the Strait of Gibraltar, Melilla, Murcia, the Valencian Community and the eastern side of Castilla La Mancha. The showers and storms will likely be strong and even very strong or persistent and localised hail storms may be experienced. From Tuesday, 11 September, and for several days the evolution of the DANA is uncertain, but likely to be positioned between the south of Portugal, the centre and the southeast of the peninsula. Therefore, it is difficult to specify the affected areas. It is likely that on Tuesday the rainfall will be limited to the southern half and centre of the peninsula and that, starting on Wednesday 12, will tend to spread to much of the Peninsula and, perhaps, also to the Balearic Islands. Looking ahead to the following weekend (15 and 16 September), the DANA is likely to weaken and there should be a decrease in the intensity of the rainfall.